Home Health Awareness Is Fainting A Sign Of A More Serious Health Concern? Is Fainting A Sign Of A More Serious Health Concern? Most of the times, the cause of fainting is simply minor. However, there are times wherein it could be a sign of a serious underlying medical condition. Here is the list of some of the more serious health concerns that can cause fainting. Dizziness and fainting, together with muscle weakness, numbness, and tingling as well as slurred speech can be a warning signal of a transient ischemic attack (mini-stroke or TIA) or an ischemic stroke if a blood clot in the brain is obstructing blood flow. Shock is another cause of fainting. It is a condition caused by a sudden drop in blood flow through the body. Some signs and symptoms of shock may include over breathing, low blood pressure, decreased urine flow (oliguria), cold, clammy, and grayish-bluish (cyanotic) skin as well as a sense of great anxiety and foreboding, confusion, and sometimes combativeness. There are different reasons why someone goes into shock. It could be due to any kind of physical injury, a traumatic event like a car accident, witnessing something horrific like a death, allergy reaction or severe infection, or due to a severe loss of blood. 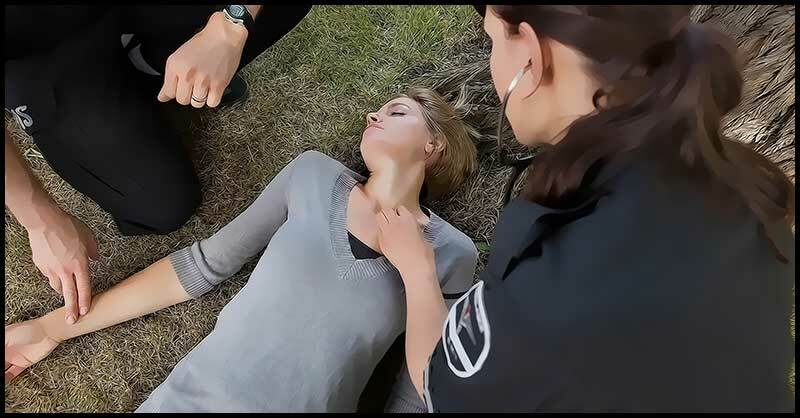 According to Very Well Health, 1 in 4 persons may experience fainting due to a cardiac cause. Some heart problems cause fainting due to an obstruction of blood flow through the heart, thus causing a drop in the amount of blood pumped by the heart. This happens due to several heart disorders such as hypertrophic cardiomyopathy, heart valve disease like aortic stenosis and mitral stenosis, a cardiac tumor, or obstruction in a major blood vessel near the heart. Along with fainting, patients may also experience chest pain and heart palpitations. This can lead to a sudden episode of fainting as a person experiences irregular heartbeat that’s either too fast or too slow. The amount of blood (too little or too much) that reaches the brain causes fainting and dizziness. If cardiac arrhythmia goes on for several minutes, it can cause fainting that can also cause sudden death. Orthostatic hypotension, also known as postural hypotension, is a form of low blood pressure that happens when you stand up from sitting or lying down. This can make you feel dizzy or lightheaded, and maybe even faint. Reflex anoxic seizure is a type of fainting that occurs when the heart slows down so much that it actually stops beating for about 5 to 30-seconds. It is common in children and causes seizures and turns them in a pale grey color and lose consciousness. Flu accompanied by diarrhea and vomiting can lead to dehydration and low blood sugar especially if the patient is not eating or drinking an adequate amount of water. Due to this, fainting and dizziness might be experienced. Prescription medicines may cause problems and have side effects. According to studies, prescription drugs such as anti-anxiety and painkillers have been associated with fainting and dizziness. According to research, if the bloodstream has an inadequate amount of fluids, it can cause blood pressure to drop. Due to this, fainting and dizziness occur. Aside from this, moderate to severe dehydration can also lead to weak pulse, heart failure, hypovolemic shock, muscle contractions, convulsions, and rapid breathing.